32 ct. Willow Green Belfast. CC, GAST & DMC threads (2 over 2). Ooh, I love this design and have it on my wish list. Will be watching it grow with great interest. Glad you and the family got home safely. Your new start is adorable. Great start! I love the color of the house. I should make a note of that. BP is so cute! Belle is coming along so pretty! You should consider joining the Crazy January Challenge 2011-15 new projects for the new year are probably already on your list! Lovely Belle! You are so lucky that you can stitch in the car. I can't even dig through my purse without getting carsick *barf*! ha! Also, Shores is so, so beautiful. LOVE that mermaid! Pretty new start!!! Glad you are home safe and sound :-). 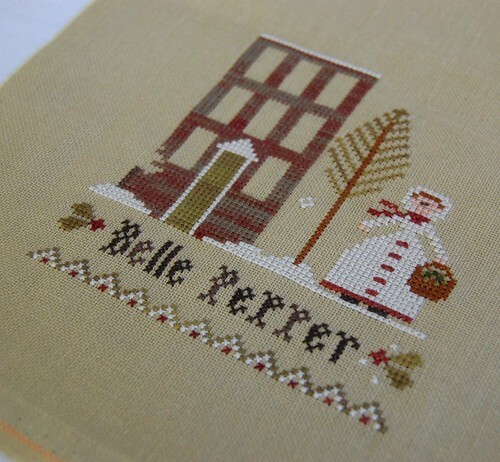 Belle Pepper is so cute...can't wait to see the finish! So cute Nicole and so perfect for this time of the year!! Love your new start - so cute!! Ooooh, I love the colors in this one! Glad you're home all safe and sound! Very pretty! Can't wait to see what you are going to stitch for the new year. Glad you made it home safely...hope to see you Saturday. Great start on Belle Pepper! Love this design! Darling new start Nicole! Glad you made it home safely with all the traffic. Lovin' Belle! I'll definitely have to had her to my wish list - I love Jenny Bean and any friend of Jenny is a friend of mine! Я восхищаюсь вашими работами, очень красиво!!! Чудесный блог, рада быть вашим читателем. Belle Pepper is too cute! Great car stitching! Любуюсь работой LHN, очень красиво!